“The state of Washington has a proud history of inclusivity, tolerance and compassion for all residents. Our diversity of people and cultures is a critical part of who we are, both as a state and as a nation. We will not let President Trump’s orders break faith with our state’s fundamental values. “The president’s executive orders on immigrants signal that the better angels of our nature will not be realized. These actions, if implemented, would be mean-spirited, unnecessary and contrary to our values as Americans. “We will not be intimidated or divided. The president this week has reminded us that people’s voices are more important than ever. Together, we will resist any effort that would violate Washington’s values, take away the opportunity for higher education or break up hard-working families. “We will not stand by and allow Huskies and Cougars, and so many others to be turned away from their campuses and our state. They are dreamers and we will not allow this order, or any order, to keep them from their dreams. “We are not powerless. We will resist any attempt to reduce our nation’s already small contribution to aiding people and families who fall victim to global humanitarian crises. “Any attempt to compromise the ability of our law enforcement agencies to focus on their job of keeping our communities safe will be resisted. Gov. 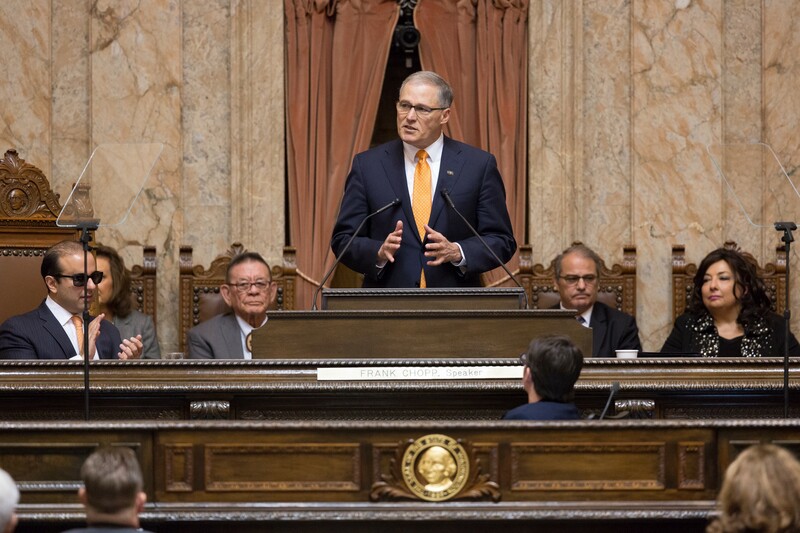 Jay Inslee during his inaugural address in the House chambers in Olympia, Wash., Jan. 11, 2017. In 2015, Inslee spoke out forcefully against those who advocated blocking entry of Syrian refugees into their states, saying that his state would not reject refugees fleeing violence in Syria, as other governors sought to do. In a letter to state legislators at that time, Inslee also explained the rigorous, secure, multi-step vetting process used by federal agencies before refugees enter and are resettled in the United States. And in 2013, Inslee joined with State House Speaker Frank Chopp, State Senate Majority Leader Mark Schoesler and other state leaders in urging Congress to pass comprehensive immigration reform that provides a pathway to citizenship and key changes to worker visa programs to support Washington industries and economic growth. The U.S. Senate then passed bipartisan, comprehensive immigration reform legislation, but Republican leaders in the House refused to allow a vote on the bill.